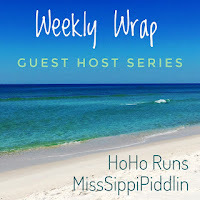 Join in the fun 💙 Tara @ Run and Live Happy is hosting this week! 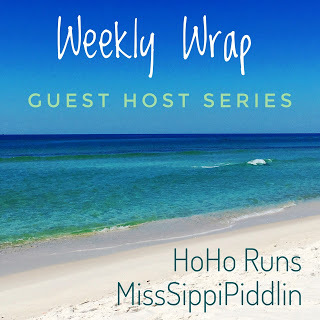 It was a non-running kind of week. My ankle started feeling really funky after I ran Tuesday morning. I felt twinges of pain when I was walking up and down the steps at work, then it felt weak a few times, it ached...and I got nervous, like I always do that something was fractured. Since I've had a stress fracture I always extra paranoid. I looked at an ankle diagram and thought, well dang, that is complicated. It hurt right under the knot on the ankle so it is likely ligament or tendon, but who knows...I couldn't get to the foot and ankle specialist, it was the last week of school -too busy! Ice, compression, and no running was my routine. I think I must have tweaked it when I fell last week. I tore up my left knee, however I landed on my right hand and cut it. My right wrist was sore, it took all week before I could grip anything w/o pain. I have no recollection of how I tore up both sides of me, it happened too fast, so I can not be certain I twisted something, but it seems likely. Anyhoo...I tested my ankle Saturday and it felt fine while running and I had much less discomfort later in the day, so I think whatever was irritated is on the mend, but it really screwed up my last week of training. 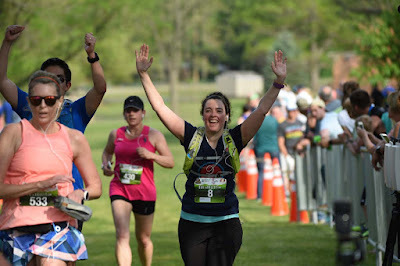 Next half marathon is June 24th. Yikes!!! Hoping the time on the arc machine will help. Do you think it will?! On a completely different note, Tweek my 15 year old cat was extremely ill and lethargic for days, not eating, and lost a lot of weight, but he rallied a few days ago and took a turn for the better. My toothless wonder started eating baby food (chicken and broth- no onion or garlic for cats) and now has progressed to soft Rachel Ray food. He is back to being chatty and it brings joy to my heart. I have summer plans on my mind! Summer running started here early in April and I've been having a very hard time finding the will this year to push on. I do okay on shorter runs but my long run game is off. 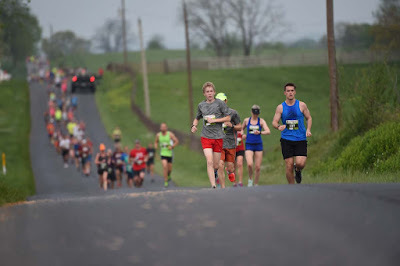 I don't know how I managed to marathon train last year, but I can tell you, this year I wouldn't be able to pull it off. I have grosser pics but I don't want to make anyone queasy! My happy Hump Day run! Saturday the usual weather was back and so was my weakness. I frolicked in a few sprinklers and it helped me to push myself a little. I wanted to quit at mile 6, but I was able to get to 8, (planned distance was 12) but my sprinkler dips caused my bandage to start slipping off and flapping. When I stopped to adjust my bandage, I could not find the will to go again without intervals. I picked 4 x 1 on my watch and made it 3 miles...bailed on the last mile - it just isn't in my being to make myself that uncomfortable right now. I've been very happy I’ve been able to hold my mileage right at 100 miles from March to May, but I don’t anticipate holding onto that in June or for the rest of the summer. 100 mile months challenge me and I've had a few bumps along the way…I’ve had to string together rest days a few times, four of five in a row, because I feel a little pinch in my calf, or my (PIMA) right glute flares up, or my feet start aching, but so far (KNOCKING) I have been able to bounce back and keep going! I hope I don’t jinx myself by writing that! I am tossing some ideas around to keep myself moving July to September, but I haven't quite nailed down my summer plan. I think I am leaning toward a 10K being my long run each week. I want to give myself a break from running distance in the summer humidity. I do know a few things for sure! 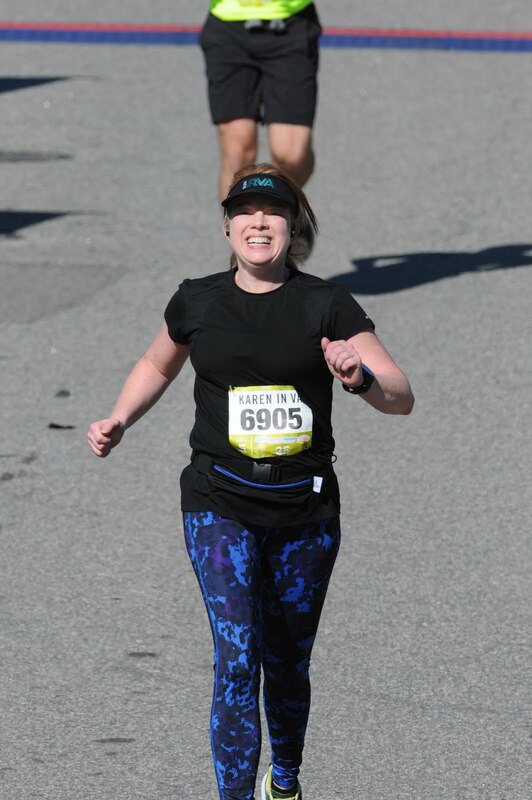 A few years ago I did 10K Friday with my run buddy. I work four ten hour days in the summer and it was fun to knock out our long run on Fridays. I stayed in decent shape that summer, I actually set my half PR in November that year! I like to think in terms of time when setting goals instead of miles in summer, because I slow down so much. I want to maintain some kind of base for running but I don’t want to feel like I am training. I’ve considered 3 hours of running a week for my target. That would break down to three runs about 40 minutes each and my 10K. Four hours...that's three runs about 55 minutes each and my 10K, but that means I have to be on my feet and running right at 5 a.m. and lately I have not been winning with the alarm clock. I want my goal to feel attainable and also allow some room, so (((hopefully))) I can get motivated to start weight training again. I seem to accomplish more when I set some kind of goal for myself. It gives me motivations, helps me to overcome procrastination, and I like being able to measure my success. Does three hours a week seem to little? 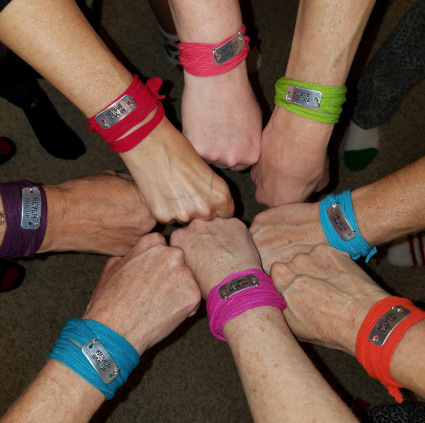 Do you set mini goals even when you are not training? Are you a wing it kind of person? 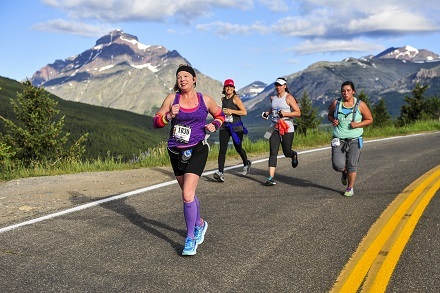 Does a 10K feel like a "long run" to you in summer? What are you doing for summer? 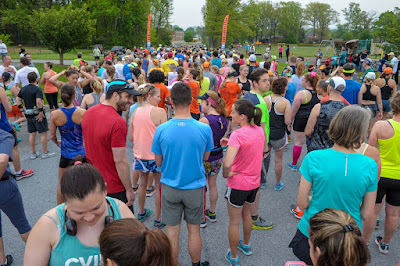 This course takes you from Stuarts Draft Park to Waynesboro’s, Ridgeview Park. 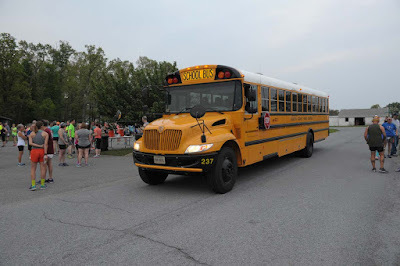 All the parking is at the finish line area, so you hop a bus and ride to the start line in Stuarts Draft. This is about two hours from home...I was nervous about driving at 4 a.m. since I really don't know the area. I am always nervous. Am I going to have a hard time finding it, ? parking, ? etc...next year if I do it I will drive in the morning, it was super easy access and had plenty of parking! Yay! I ended up at Day's Inn and it was nice. I actually had a friend to meet at this one! 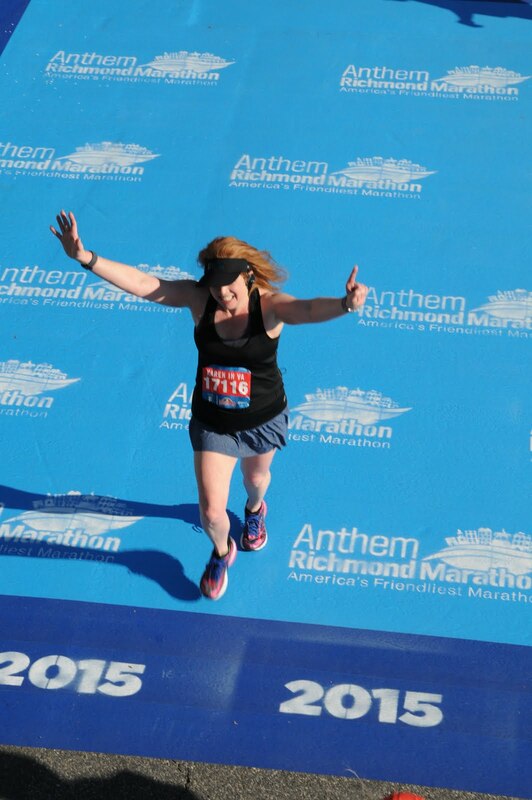 I met Mary on Instagram and we hung out briefly at the Richmond Marathon. I was super excited to see her again and have time to chat on the bus ride. 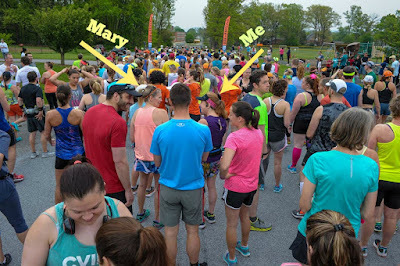 Mary is pretty speedy, so once the race race starts I am in her dust, but anytime I actually have a friend at an event it is a treat for me. Riding in style to the start line! It took awhile to get to the start line, I was reminded how far 13 miles is! ...and remember I said in my May Runfessions I didn't even get in a picture...well, I lied. I was flipping through pics and noticed Mary and I chatting at the start line 💙Where's Waldo??! It was a bit congested the first mile! It eventually thinned out, but it did take a few miles. 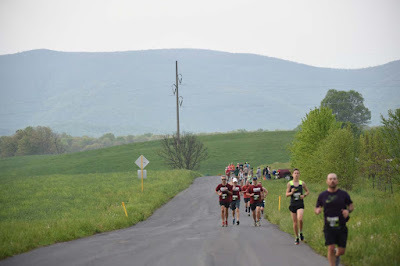 The course had rolling hills and really tranquil views...but it was HAAAWT!!! 80 degrees, hot and sticky. The water stops were spread out every few miles and I didn't carry hydration. It was hot, I knew I couldn't go fast, so I just trotted along, enjoying the day, wishing it was cooler. 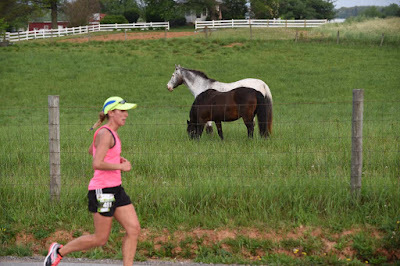 Random person running by the same horses I saw. I passed a bunch of cows as well. 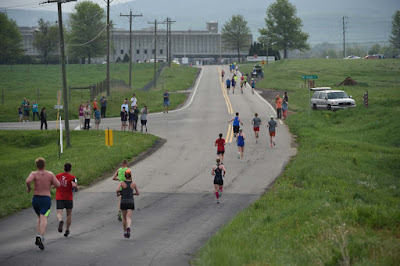 Lots and lots of country roads made up this course. 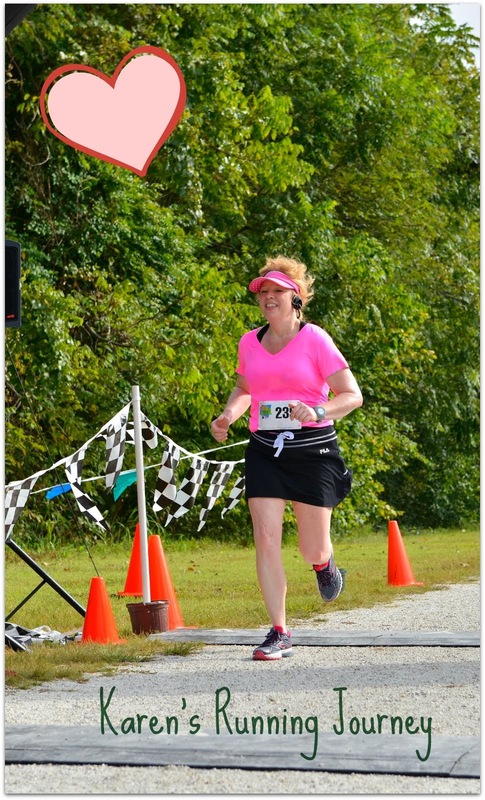 Eventually I ran up the last big hill and into the park finish line area. I did not finish feeling like the gal pictured below 😅😉 I WISH I did!! That is Mary in the peach shirt and plaid skirt. This was the sub 2 crowd. It would take me another 20 minutes to finish. I was so drenched, I was dumping water over my head the last few water stops trying to cool off. Seriously, I am already over summer running. Mary snapped this for me as I was coming to the line! Mary and I hung out at the after party for awhile talking, then I drove back to the hotel, showered and headed home. 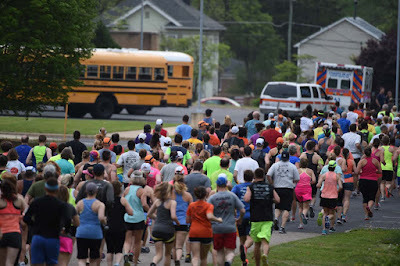 Even though I was about 10 minutes slower than my A goal, I never regret running an event. Had I been at home, I would have never run that far! A goal, B goal, or C goal, 13 miles still feels like an accomplishment and it is a good feeling! 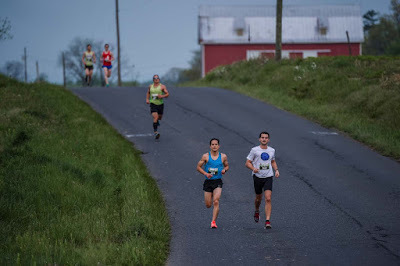 I plan to run one more half in June before I take the summer off. 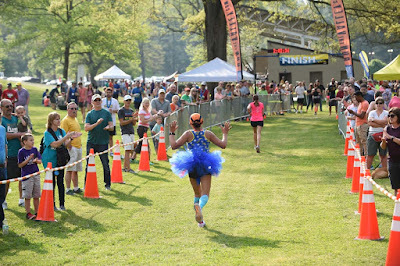 This was my second finish line of the month on grass. Oddly, grass feels a bit tough, maybe it is the transition after being in gravel and pavement?? Have you run much on grass? Have you been on a school bus lately? What is you half number? Have you lost count yet! ?